Passengers are welcome to board our ship at 6:00 p.m. After comfortably settling into your cabins, we'll introduce our crew at a welcome cocktail. Sit back and enjoy a presentation about your CroisiBike vacation before dinner. We'll cruise to Pauillac. Towards the middle of the morning, we'll set off on our bikes for the day. We will first bike to Saint-Estèphe, a town famous for its Baroque architecture, and its stunning view of the Garonne. We'll enjoy a picnic lunch. In the afternoon, you'll bike along the beautiful vineyards in the Médoc region and indulge in a wine-tasting* session. We'll return on board for an evening of entertainment. We'll leave early and spend the morning cruising the Gironde to the estuary. We'll cruise along the marshes and see the steep cliffs of Meschers-sur-Gironde, troglodyte homes and fishing cabins before reaching Blaye. We'll leave on our bikes in the afternoon. The itinerary will bring you to Blaye, with its vineyards, rich croplands and castles. You'll then head to Bourg. If you feel like it, you can bike a few more miles to Saint-Gervais, where you'll be able to contemplate magnificent landscapes from the shadow of its medieval church, before returning to Blaye for the evening. After you return to the ship, enjoy an evening of dancing. Early in the morning, we'll cruise on the Dordogne towards heritage-rich Libourne. In the afternoon, you'll start your bike tour through Saint-Émilion where we'll visit its underground monuments. We'll return on board after our tour for an evening of entertainment. Our ship will cruise for Cadillac. Its preserved countryside, hilly landscapes and many small and quiet villages hold a wealthy heritage. You'll start biking towards the south in the afternoon, along the Garonne. You'll bike through the Sauternais, a region known for its sweet dessert wines, and Sainte-Croix-du-Mont, where you'll have a stunning view of the valley. After your day of biking, you'll return to the ship. The evening is free to do as you please. We'll start biking early this morning. While you enjoy the French scenery from your bike, the ship will cruise towards Bordeaux, its final destination. 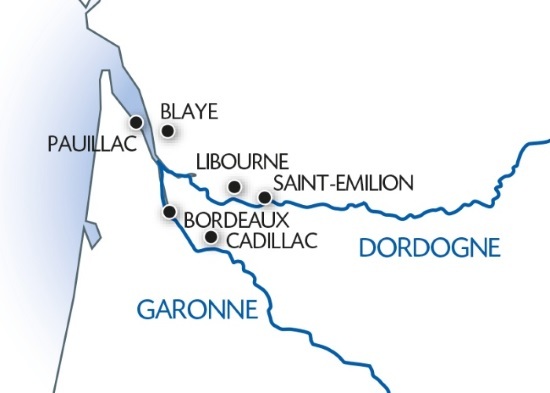 Your tour will begin with the fortified city of Cadillac and will end in Bordeaux. Stops are planned in La Sauve and Cenac. We'll enjoy a picnic lunch next to the Sauve-Majeure Abbey, which used to be a Benedictine monastery. In the afternoon, you'll continue heading to Bordeaux, where you'll have the afternoon to roam across the city on your bike at your own pace. Tonight is our gala evening and dinner. This morning, a minivan will drive you to the departure point of your bike tour on the Atlantic coast. You'll bike along the coast and the Pyla Dune, the tallest sand dune in Europe at more than 328 feet above sea level. You'll enjoy a picnic lunch in Arcachon, a famous seaside resort frequented by aristocrats since the second half of the 19th century. After lunch, you'll board a boat with your bike and head for Cap Ferret, renowned for its oyster farms. We'll return on board in Bordeaux at the end of our long day. After dinner, we'll enjoy an evening of entertainment. Join us for a trip to the heart of the authentic Gironde region! Explore its many emblematic sites by bike from Blaye to Arcachon via Bordeaux, Saint-Emilion and Cadillac. Ride along famous vineyards, taste* local wines, and admire truly unique landscapes such as the dunes of Pilat. Do not miss out on the majestic Sauve-Majeure Abbey.